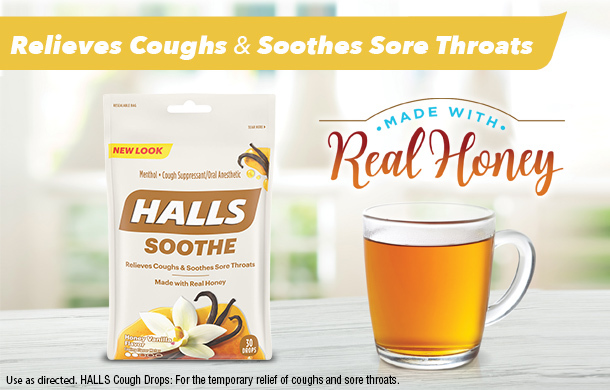 HALLS Made with Real Honey Cough Drops are here to help relieve those disruptive coughs and sore throats. 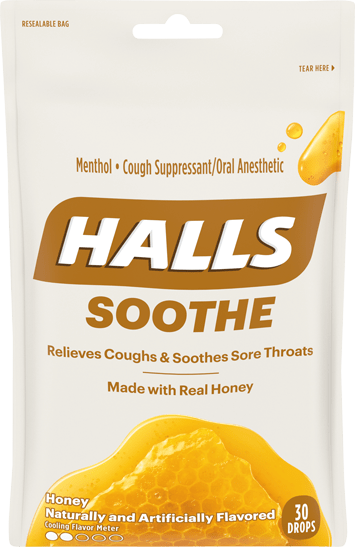 With a taste of real honey to help the menthol go down, HALLS Made with Real Honey Cough Drops are available in Honey, Honey Vanilla and Honey Chamomile flavors. Adults and children 5 years and over: Dissolve 2 drops (one at a time) slowly in the mouth. Repeat every 2 hours as needed. Beta carotene, flavors, glucose syrup, honey, soy lecithin, sucrose, water.